Back in the 90s there was a method of making yogurt that was popular, using a thermos for the incubation period. I gave it a try, and was very unsatisfied with the runny, stringy results. So I abandoned the idea of making my own yogurt. Then recently, I read of others using crockpots and picnic coolers for incubators, with great success. Well, this really played into my recent grocery budget probs -- not big problems, just that I was going over budget by $10-20 per month. Part of that extra spending had been store-bought yogurt (on sale, but still, it was causing me to spend a bit more than I wanted on groceries each month). So, the stars all fell into alignment (meaning whole milk was on sale, the very same day I found a container of Yoplait vanilla yogurt on markdown, just a day after reading up on yogurt making). I read several recipes and procedures (I study up on things that I'm about to attempt), and decided that the picnic cooler method would suit my equipment well (especially since my slow cooker runs very hot). Stock pot -- check, candy thermometer -- check, picnic cooler -- check. That was about it for special equipment. After giving our cooler a thorough cleaning in the bath tub (followed by one of my daughters having to give the bath tub a thorough cleaning), I got out my huge stainless stock pot. It didn't have to be huge, but this stock pot had all the features I was looking for: completely smooth bottom interior, thick base, and non-reactive stainless. 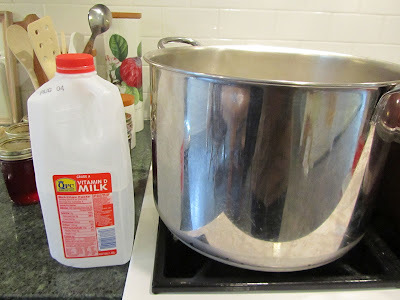 Pour whole milk (not low-fat or skim, and definitely not ultra-pasteurized) into stock pot and bring to 180-190 degrees F over MED heat -- stir regularly. Alternatively, you can heat the milk slowly, over MED-LO, stirring as needed, for about 1 hour, then increase heat, and stir frequently, until 180-190 degrees F.
When milk cools to 115 degrees F, whisk in yogurt. Use 6 ounces (180 mL) of plain or vanilla yogurt (see below for brands that work well) for 1 gallon (3.8 L) of milk, or 4 ounces (120 mL) yogurt for half-gallon (1.9 L). Some folks put the starter and some of the heated milk in their blender, or use a stick blender, to thoroughly incorporate the starter into the milk. Fill and cap jars. Lacking caps, I also just use a square of plastic wrap, secured with a rubber band for a cap on each jar. Pour 115 degree water into picnic cooler about 3 inches deep. (I pour my sterilizing water, plus any cold water needed to get the 115 degree F temp). The correct temperature is important! Place jars in this 115 degree F water in cooler. Close cooler and wait 3 to 4 hours (I don't worry too much about the timing, 3 hours works, but so does 4, and I've even left it in for 5 and it was still mild). I, now, prefer to leave my yogurt for 7-14 hours. It becomes thicker and has a more tangy flavor, as well as has a reduced lactose content. Remove jars from cooler and refrigerate for about 6-8 hours. Yogurt firms up during this time. I set my canning jars to sterilize (2 one-quart jars (almost 1 liter each), as I was only going to make a half gallon, just in case it flopped). I poured 1/2 gallon (1.9 L) of whole milk (needs to be whole milk, not low-fat or skim) into the stock pot, and began heating over Medium flame (my stove top is gas). It took close to 30 minutes for the milk to come to 190 degrees F (87 C). I stirred it regularly with my special milk-stirring utensil (see photo). 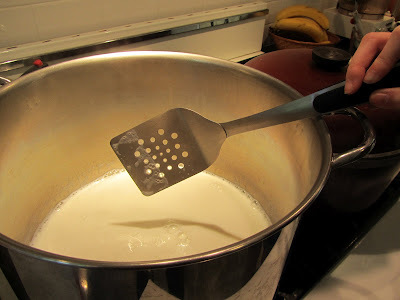 **tip here** This is something my mother-in-law taught me -- when cooking something with a lot of milk (like pudding), use a flat-edged metal spatula for stirring. 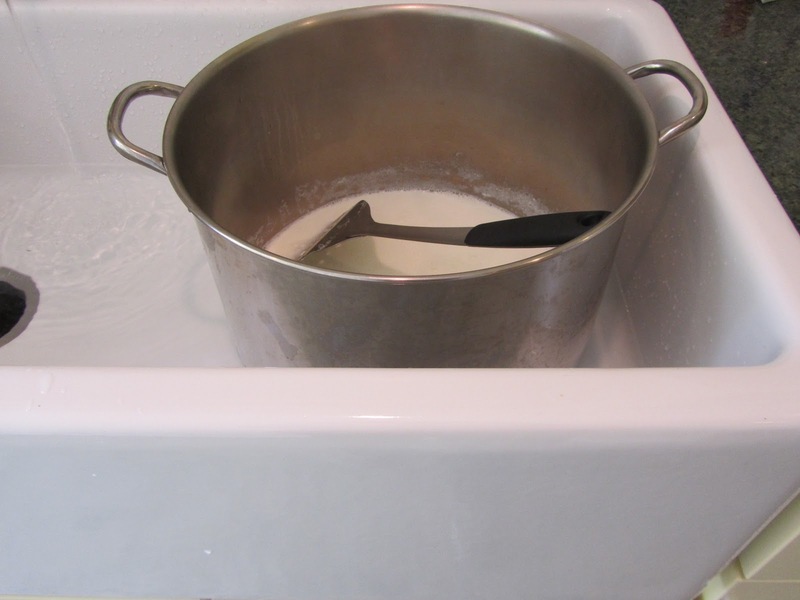 With it's flat edge, you can continually scrape up the bottom of the pan, before any milk can scorch or stick. It's a dandy little trick. Try it with pudding sometime, and tell me what you think. While the milk was heating, I had quite a bit of time, so I made a batch of banana muffins simultaneously. It worked out well, timing wise. I frequently do a batch of muffins while I've got something else happening in the kitchen. It's a great way to get a double-play out of my time. I also cleaned out my wonderfully large farmhouse sink, readying it for plopping the hot milk-filled pot into a cool water bath. Once the milk hit the magic number of 190 degrees F, I whisked the pot over to the sink, and began the cool down process. It took me by surprise how quickly it cooled. Thirty minutes to heat up, but only 5 or so to cool down to the required 115 degrees F (48 C). 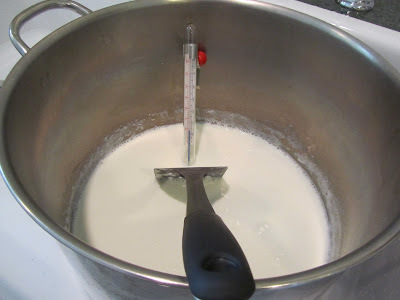 In fact, it cooled so quickly, I actually had to move the stock pot back to the stove to get it up to 115 F.
Once at 115 F, I quickly stirred in (with a whisk) the Yoplait yogurt (1/2 cup (120 mL), as I was only making 2 quarts of yogurt). I poured it through a strainer to remove filmy stuff, and then filled my sterile canning jars with this milky concoction. After 3 hours in the cooler, I moved the yogurt to the fridge. I was curious just how warm the little make-shift incubator remained. So, I took the temp of the water and found it about 105-110 F (40-43 C), after the 3 hours! 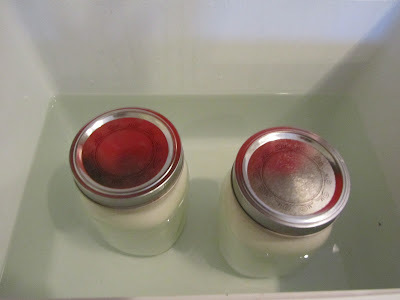 As I'm interested in chain yogurt-making (using starter from one batch to begin the another), I did a little research on what it takes to keep the bacteria strains alive and healthy. There are many strains of bacteria used in yogurt-making. Some (referred to as "direct set"), will only fully set one batch of yogurt. (Inexpensive, store-brand yogurts are often made with direct set cultures.) Lactobacillus acidophilus, while a beneficial bacteria, is a direct set variety and will die out in the process of chain-yogurting. The blog "The Frugal Girl" recommends both Yoplait and Dannon. There are other very good yogurts with the right bacterial strains, as well, but may or may not be labeled with their particular bacterial strains. Stonyfield comes up repeatedly in discussions on good yogurts to use as starters for chain-yogurting. Here, in the US, all products that are sold as "yogurt" must contain cultures that include both L. bulgaricus and S. thermophilus. However, the amounts of these bacteria can vary from product to product. Yoplait does not disclose the strains used on their label. But given the good performance when used as starters, they must have enough of the two strains. I used Yoplait simply because it was on sale. If I begin with a new culture, I may try Dannon or Stonyfield, as their brands come up time and again in discussions on making yogurt at home. If using your own yogurt as your starter, do so every 5 days, for best activity in the bacteria. The longer your yogurt sits refrigerated, the less likely you'll have a good set. If your yogurt consumption is not up to those levels, or, you will be out of town on vacation and unable to make a batch "on schedule", or, if you prefer to make a larger batches, and thus make yogurt less often, try freezing some of your homemade yogurt the day after you make it. Freeze in quantities that you will need for starter for future batches. For instance, I think I will prefer to make 1/2 gallon at a time, so I will be freezing 1/2 cup starter in each container. To use, thaw overnight in the fridge, or on the counter for a couple of hours, while heating the milk. Do not heat to thaw your starter! Do not microwave your starter to thaw! Technically speaking, "real" Greek yogurt is yogurt made with a specific bacterial strain. But you probably don't care if the bacterial strain is authentic or not, you just want the rich and creamy mouth-feel of Greek yogurt. Good news, it's extremely easy to do yourself. Simply put a mesh strainer over a bowl. Line the strainer with cheesecloth or a coffee filter. Pour your yogurt in the cloth or filter. Refrigerate the whole thing, and in an hour or two (test it from time to time and strain until it's the consistency you're looking for), you will have rich, creamy, thick yogurt. The whey that strains off can be used in baking/pancake making. 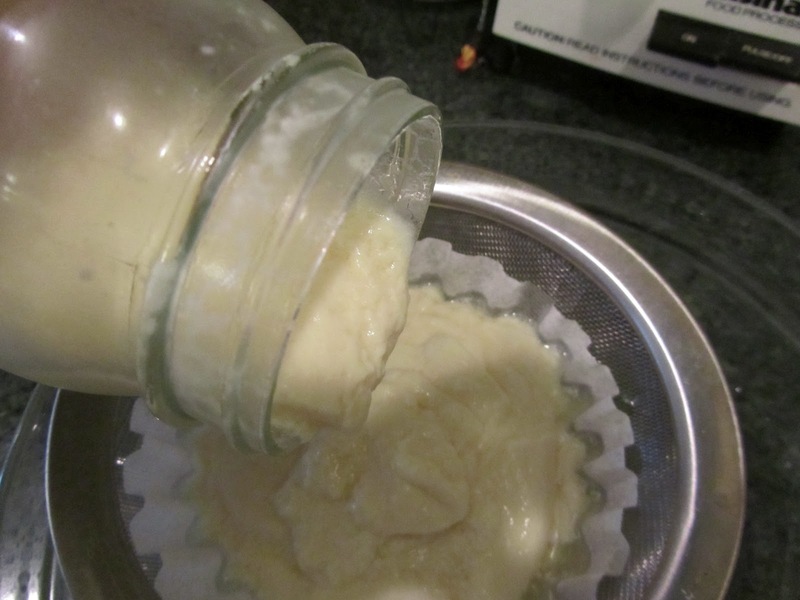 If you want yogurt cheese, continue to strain it overnight. In about 24 hours you should have something resembling cream cheese. I made my homemade soy yogurt into something close to Greek style. It was very rich, very creamy and very decadent. If you are a Greek-yogurt enthusiast, you should give this a try. Greek yogurt sells for about $1 a small container here. 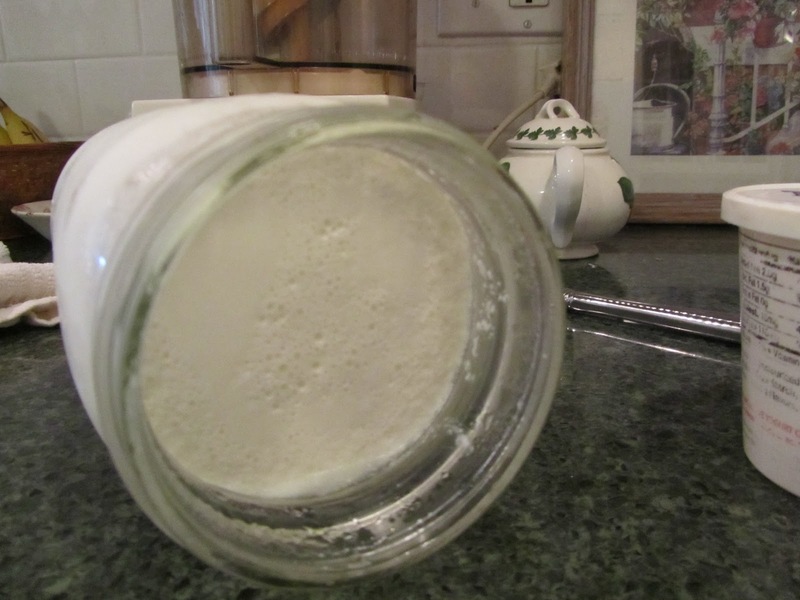 Homemade yogurt, strained to Greek-style consistency cost us about 24 cents for a 6 oz. serving. Cost for the soy alternative was roughly double, both the store bought ones and the homemade varieties. Following my success with dairy yogurt, I tried my hand at soy yogurt. Success! See here for more. So, I've been successfully making yogurt for almost a year now (on average twice per month). And in that time, I have never had a failed batch. I continue to use a descendant of my originally-purchased Yoplait yogurt from last July (2012). In this whole last year, I haven't needed to purchase any new yogurt to make my own at home. Every 4-6 batches of yogurt, I save some 2-day old yogurt and freeze. On day 2, after making yogurt, I scoop out 6 ounces of yogurt into freezer containers, then pop into the freezer until I make yogurt again. On yogurt-making day, I thaw 1 container of yogurt on the countertop, while the milk heats. Once thawed, it looks runny. Don't worry, this will still set yogurt. I just whisk it into the heated, then cooled milk and we're good to go. Many folks add powdered milk to yogurt, or strain next-day yogurt to get a thick product. My method takes time, but little effort. I simply heat the milk slowly, over Med-Low, instead of trying to speed things along on Med. Like I said, this does take extra time, sometimes 2 hours, instead of 30 minutes. But this extra heating time allows for more evaporation, and a naturally thicker product. My family really likes the thick yogurt. I make yogurt only when I find a deal on whole milk. When I do find this great deal (usually milk for $2/gallon or even less), I buy as many gallons as I can, and freeze most of it to make yogurt later on. Frozen milk, thawed in the fridge for a day or two, works great in yogurt. Freezing doesn't seem to harm the milk for yogurt-making. I use 6 ounces of yogurt starter for every 1 gallon of milk. If I'm doing a half gallon of milk, I go ahead and add the entire contents of a 4-ounce container of starter. I refrigerate this until I'm ready to make a batch of muffins or pancakes for the family. I put the milk film through the food processor or blender along with other liquids, to use in pancake or muffin batter. No waste! What about heating the milk in the microwave? I have tried to heat the milk in the microwave, for speed. While this is a faster heating method, there seems to be little evaporation, and the yogurt tends to be thinner than we like. So, those are my updates for now. Anything else, and I'll add it here. I accidentally left the yogurt to incubate over night a while back. I think it sat in the cooler for about 13 hours. Ooops! But guess what? It turned out great. It was thicker and more tangy than 3-hour yogurt. But it was still safe and good for eating. So I looked into leaving yogurt for more hours to incubate. And it turns out that the longer you allow it to incubate, the more of the lactose gets eaten up by the bacteria. A "win" for those of us who are lactose-intolerant. For now, I'm allowing the yogurt to do its thing for about 7 hours, and I really like how thick it becomes and the tangy taste. So, for creamy, mild yogurt, allow it to incubate 3 to 4 hours. For thicker, more tangy yogurt, allow the yogurt to culture for 7 hours. And I'm still using descendants from the very first purchase of Yoplait for a starter, by freezing small amounts for future batches. Not bad! Almost 2 years from 1 purchase of starter! I am STILL using a frozen descendent of yogurt starter from my very first batch. And I've discovered that I prefer yogurt that has sat in the cooler overnight, about 10-14 hours. What's the key to my success thus far? I think it's always heating/cooling/incubating my milk/yogurt at the correct temperature, and always sterilizing my jars before filling. I always make 1 gallon of whole milk into yogurt at a time, now, and always use 6 oz of starter yogurt. And I always use starter yogurt that was frozen on Day 2. I never use 4, 5 or 6 day old refrigerated yogurt as my starter. Good luck to you! Email or comment with any questions! I am still using a descendant from that first container of Yoplait, as my starter yogurt. For this last batch of homemade yogurt I used a starter from my freezer that had been there for over a year, and the yogurt still turned out great. My freezer is a 0 degree F freezer. My thinking is that yogurt cultures remain viable for a year and a half or longer if kept at 0 degrees. Results may be less reliable if storing yogurt starters in a freezer that is not as cold, or that repeatedly self-defrosts. I made yogurt this month with some frozen starter which was dated June 2017. Yep, it had been frozen for nearly 2 years and it still made high quality yogurt. This starter is a descendant from my first container of Yoplait, bought in 2012. I've made dozens of batches of yogurt with descendants of this starter, and still the yogurt is high quality. After making yogurt for about 7 years, I have found that sticking to precise temperatures in heating the milk and incubating the yogurt is perhaps the most important aspect of successful yogurt-making. Making my own yogurt is very satisfying. A gallon of milk plus 6 to 8 ounces of starter yields 3 and 1/2 quarts of yogurt, for about $2.20. That's about 63 cents per quart. That's a savings of over $4, if I had bought 3 1/2 quarts of plain yogurt at the grocery store. Very satisfying. You are one talented, creative, savvy little gal! You can be very proud of your accomplishments. I'm having one of those days, today, where nothing is going as it's supposed to. So your comment helped to cheer me! You know when I forget the camera? When we go places. I get there and think "oh this would make such a lovely photo", and only then do I realize I haven't a camera with me. I have often made yogurt using a crockpot overnight. I am okay with my results, but want to give this method a shot. I use the Aldi Fit and Active yogurt as starter - it has both of the strains of bacteria you listed in your post. I was very pleased with the results of such a simple incubator -- a picnic cooler filled with warm water. (Check out Frugal Girl's instructions for yogurt making). I've never tried using the crockpot method. But I did read on one blog that one person's crockpot didn't reach the ideal temperatures for incubation. Do you have a candy making thermometer to check to see if the temp is right or not? Good to know about the Aldi Fit and Active yogurt. This is awesome! I was going through your archives and found this. Thank you so much. I've been wanting to make yogurt at home for a couple of years. And I've got all the equipment right here at home. Oh, I'm so excited! I'm so glad for you! Good luck, and feel free to ask questions should you encounter any problems. Twenty or thirty years ago, we read about how to make yogurt in a Styrofoam cooler lined with rolled newspaper. Ironically the yogurt was so tasty that I couldn't ever make enough of it. My family inhaled the yogurt until I gave up trying to make it at all. It sounds lazy, but I honestly gave up making stuff that I simply couldn't keep in the fridge. Now my reasons are different. Milk allergies prevent us from spending more on milk (almond milk) products when our food budget is already so challenged. That said, your post has inspired me to think through this again. I wonder if we can make yogurt with coconut milk. You inspire me! I've successfully made yogurt with soy milk, but never tried coconut milk. I did read a bit about using coconut milk. 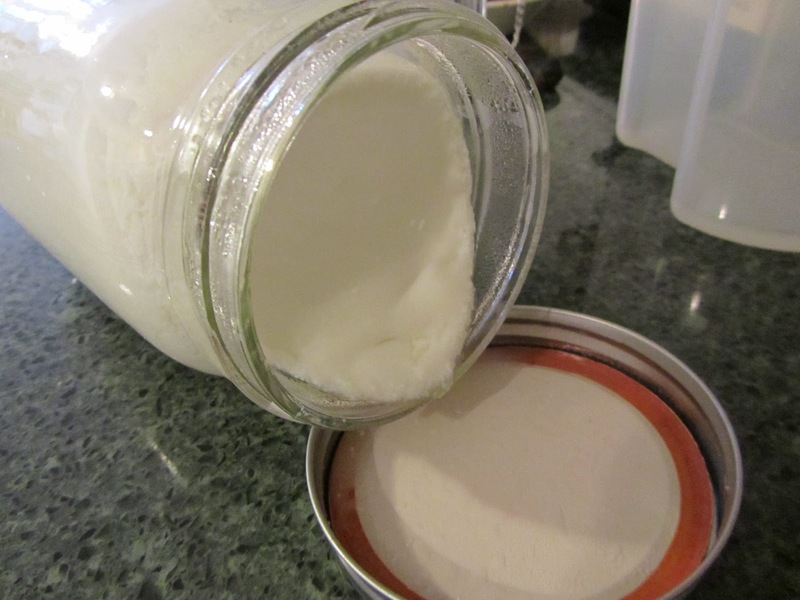 Here's a good link to making yogurt with coconut milk. They give pretty good info on how to make it work. I found you on the Living on a Dime newsletter. You stated the starter yogurt my only be good for 5 days and this is the reason for freezing your starter. How long is the yogurt good for in the refrigerator after making it? I usually keep store bought up to 2 weeks, but I really want to try your recipe. Thanks for the great blog. I'm glad you felt you could ask this question. Let me clarify. The yogurt itself stays good for eating for up to 1 month in the fridge, if the jars are unopened. About 7-10 days once opened. This is for eating. But for using the yogurt to make new yogurt, you need a healthy amount of the good bacteria still in a small portion, and after about 5 days in the fridge, the bacteria counts begin their decline (they don't go to zero over night, but decline enough that yogurt might not set up). Freezing seems to suspend the activity of the yogurt bacteria, so I can wait 2 weeks or 2 months before I make another batch, using some of the previous batch as starter.